Like leaves adrift in an autumn breeze, dust motes circled in a shaft of sunlight. The yarn of the gray shag rug was soft beneath bare legs. My sister and I were sitting on the floor in our parents’ bedroom, watching TV on the black and white set. As if life could not possibly be any better, our mother gave us each a stick of Wrigley’s gum. Bliss. Sunshine, spearmint, and TV. And then – it must have been during a commercial break – the screen filled with a series of photographs: the FBI’s Most Wanted. Some of the faces were female. Wait. What? Women could be murderers? Women? Women were mothers, babysitters, teachers, and nurses. They took care of people; they did not hurt them. My childish sense of the world as a safe place received its first fractures that day. How old are most kids when they learn about the Holocaust? Maybe seventh grade? So, about twelve? That was the next jolt, being twelve years old with hellish knowledge to process and store. Didn’t the guards at those camps have mothers who taught them to do unto others as you would have others do unto you? Didn’t they have children? Had they never been children themselves? Thankfully, that brutality happened in the distant past – a decade prior – on far-away shores. Everyone had learned the lessons of that evil and it would never happen again. I clung to that belief as long as I could. I believe, ultimately, in an orderly universe, but I can find no place in my wishful credo for the Holocaust, so it floats out there, evil inexplicable. And last week, two young men dropped lethal backpacks at the feet of children, and walked away. So battered have we Americans been in recent years by armed men and Nature tempestuous, that the fragility of routine has been laid bare. I perceive the humdrum with flickering antennae: shoppers filling carts with Wheaties and milk, restaurant-goers sipping wine and perusing menus, teenagers tapping cell phones while strolling a sidewalk, families cheering loved ones at the finish line of a race. So normal. So easily blasted apart. Deep breath. Deep breath. Quell the prickle in my nose, the mourning in my soul. This is new to us in New England, but it is not new. And it is in contrast to the goodness that unfolds minute-to-minute and hour-to-hour, so commonplace as to rarely rate media coverage. Courtesies, small kindnesses, sweeping acts. A driver risks the annoyance of those behind him to wave in a merging car. Quilters meet to sew blankets for the sick, injured and orphaned. Schools run drives for mittens and scarves. Organizations – so many of them – raise money for human rights, cures for disease, conservation, housing, and food. Strangers rip fabric from their shirts to tie tourniquets for those wounded nearby. First responders, brave, brave souls, rush toward smoke, screams, and blood, to help. The world does not feel safe right now, but remarkably, kindness is the unremarkable norm. In 1878, to revive a flagging economy, the business leaders of St. Louis dreamed up a grand idea: the Veiled Prophet (VP) Ball. Seventy-two years later, my mother was crowned Veiled Prophet Queen, and for me as a little girl, this nugget from my mother’s past was a fairy-tale come true. For my sisters, Rita and Francie, and me, there was no distinction between a full-blooded monarch and our mother. As kids, we three girls used to pore over scrapbooks bulging with newspaper clippings about Mom’s VP year. We loved the pictures of young women in glamorous gowns and dazzling tiaras, their bouquets tumbling with flowers as they waved from their float in the parade. And Mom, our mom, beaming and beautiful, in a white dress of satin and tulle, beaded and sequined, seated on her throne beside the mysterious Veiled Prophet. In February, Mom, Rita, Francie and I went to St. Louis, the first time Mom would return to her native city in three decades. In the weeks leading up to our trip, I reflected on my mother’s youth and asked her about the jolting changes of her 20th year. Just days after her VP reign ended, Mom married my father and moved with him to Camp Atterbury in Indiana where my father was stationed with the army. Mom recalled, “Our house, a square concrete place, was at the bottom of a hill, surrounded by mud. Your dad would take the car to the base, so I was stranded and alone. I didn’t know how to cook; I didn’t know anybody...” Even that was better than her first night in Germany a few months later when my father was again at an army base and she lay in bed, covers clutched over her face, frantic, as rats chewed the crackers on the bureau. I couldn’t shake the image of that young girl leaving her parents, my beloved Byeo and Poppy, following a year of VP excitement to live in the mud and cower from rodents. “Did you miss home, Mom? Did you …well, not regret marrying Dad, but….well, sort of regret it?” I asked her. Upon our arrival in St. Louis, we were greeted by my mother’s first cousin, Teddy, and Jane, his Very-Significant-Other. After lunch, Teddy and Jane took us for a drive around the city, a combination of fun sights – the soaring arch, Union Station, the brick buildings of the former Simmons Hardware Company founded by my great-great grandfather – and radical changes jarring to Mom. Her head pivoted as we drove, searching for familiar landmarks among the skyscrapers, offices, and chain stores. Our ultimate destination was a synagogue-turned library, also home to the Missouri Historical Society. When he organized this visit, Teddy, a long time announcer for the VP Ball and son of a queen himself, had alerted the curators that a former queen and descendants of the founder of Simmons Hardware Company would be paying a visit. Beneath a vibrant, star-studded blue dome, we gathered around a wooden table to flip through a box of black and white photographs nestled between sheets of tissue: archival portraits of past VP queens. Along with the two curators, we gazed at girls of sixty to eighty years ago, nineteen-year-old-perfect, statuesque in swirling rivers of voluminous satin trains, frozen in flowing gowns and feathers. Each picture was labeled with a name and a year, and we’d stop with whispered shrieks, if such a sound is possible, at 1921 – my grandmother, Byeo; 1929 – Teddy’s mother; and finally 1950 – Mom, in her beaded white dress of satin and tulle. “Hmmm,” mused Shannon, the youthful blond curator, as she eyed Mom’s picture. She turned on her heel and disappeared down a hallway, leaving us to admire our trio of VP mothers. As our whispers became less whispered, the librarians from the front desk came to check on the commotion. They did not hush us, but grinned and shared in our excitement as we held out the picture and pointed to Mom. “It was many years ago, “Mom said, laughing (sort of quietly). Two tables over, a woman with short brown hair and a doughy complexion sat reading. She was extraordinarily gracious, as she did not look our way once, at least not obviously, and neither glared nor hissed at our ruckus. Had I been in her place, I’m pretty sure I would have done one of the three. My sister, Rita, took the photos to the desk to see about getting copies while the rest of us turned to the other curator. A pale man with thinning hair, his eyes were bright as he revealed the contents of a manila folder: individual pages from a catalogue of the 1904 World’s Fair with pictures of the Simmons Hardware exhibit. On a bookshelf at home, we have one of the company’s massive leather-bound catalogues, four inches thick, with gold lettering on the spine. An illustration inside the book shows horse-drawn wagons going about their business in the streets around the Simmons factory, buildings still in existence – we’d seen them earlier - although the company is not. 125 years ago, one could order, at modest prices, corn huskers, hatchets, augurs, and hoes, washboards, carpet beaters, laundry wringers, and sleigh bells. For $48, one could purchase a dozen mounted family grindstones, although the 790 lb weight seems daunting. Also pictured, in royal blue and red, the sporty “Run Easy” buggy, ranging from $65 to $85 depending on upholstery and canopy materials. In the eighteen hundreds, even sewing machines, door knobs and ice boxes were handsome, in black enamel with gold filigree, brass and solid oak. The pleasant curator drew our attention to the design of the 1904 exhibit, at first glance, a relatively simple structure, an arch within rectangular supports, black with an abundance of decoration. “Look closely,” said the curator, and then we saw – saws! And axe blades and forks! Knives and spoons! Thousands of pieces of cutlery and hardware fanned out and lined up and placed end to end to form flowers and intricate designs. Of all the magnificent structures and exhibits created for the fair in 1904, only two remain. This was not one of them. “Yes!” The man was bouncing on the balls of his feet and I felt like bouncing myself. “Basically, it’s Thomas Jefferson’s driver’s license!” he crowed in as much of a whisper as he could manage. Shannon reappeared; we’d all but forgotten her. She pushed a wheeled cart laden with two cream-colored boxes. “I was thinking the names sounded familiar…and the pictures too,” she said. She opened the top box. It held a twenties-style pink flapper’s dress adorned with cotton flowers. Shannon turned over the tag. It had been my grandmother’s, the dress she wore on her last night as queen. Byeo wore this when she was twenty years old. Mom’s eyes were wide as she said, “I didn’t know it existed.” The tag indicated a donation made in 1960, the date my grandparents moved from Mom’s childhood home. So, they must have cleared out the attic, gotten rid of some stuff, and the dress landed here. I tried, I tried, to conjure my Byeo, not a black and white photo, but a girl, alive, filling the contours of this pink flowered dress. And the other box on the cart? Fingers clad in latex-blue lifted the lid to reveal layers and layers of tissue. 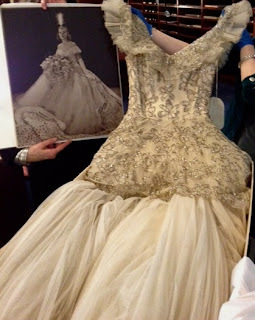 Shannon parted the papers and slid her hand under the bodice of a dress, a beaded white dress of satin and tulle: the dress Mom wore when she was nineteen years old, as VP queen of 1950. In front of the expansive bathroom mirror, Mom and I stand side-by-side, every spot and sag amplified by lights interrogation-bright. Although she has always counseled my sisters and me to favor a touch of blush in defense against appearing defeated, she rarely wears make-up herself. Tonight, however, she dabs on some foundation and brushes a hint of pink across her cheeks. She comments that some of her friends pencil their eyebrows. As I blend Clinique bronzer into my forehead, I respond that, in my experience, it’s hard to wield brow pencil effectively, although god knows I was glad for it when I lost my eyebrows to chemo. Each morning of our stay, while wielding blush and eye-liner, the available tools for repair, Mom and I have stood before the mirror and our aging reflections, each bemoaning her own flaws, while shoring the other against self-attack. She is eighty-one, I am almost sixty. (Why bother with fifty-nine? It’s a springboard only.) Her eyelids bother her, and she gives the loose skin a finger lift, while I use the same digital technique to smooth the bags creeping into my cheeks. I embrace my crow’s feet, but this cheek-wrinkle thing is distressing. With her silver-white hair and high cheekbones, my mother is beautiful, but I think, for her, the changes have seemed magnified in the constant presence of her nineteen year-old-self here in St. Louis. “We’ve both been lucky to look young for so long,” I say, but for me, that is changing, and it will be hard to look in the mirror when the face gazing back is not the one I think of as my own. When Shannon brought out Mom’s VP dress, it was magical. Our eyes swiveled from the photo, to the dress, to Mom. For some reason, I have a hard time believing in the past, even my own. That once I crouched on a weathered gray dock, watching as Poppy struggled to remove the hook from the first fish I ever caught is a sun-warmed fantasy more than a memory. That once I smeared Coppertone on little Tucker’s nose as Casey splashed nearby, feeding herself shovels of sand, is more about the scent of suntan lotion, glare, and heat, than the solid flesh we were. So much more mystical then, my mother’s youth, as conveyed through scrapbooks, queenly dresses, and stories of life-before-Lea. I remember when Mom’s hands were young and smooth, when her hair was brown, when she looked like the girl in the picture, yet I see that person so completely in the woman she is now that the two co-exist. The dress, however, was a tangible remnant, proof of a bygone fairy-tale of excitement, the perfume of flowers, and the scratch of tulle against bare shoulders.